Thanks to the inverter control it is possible to adjust the speed of the decatizing cylinder suction fans directly from the control panel, thus rendering more effective and accurate the delicate operation of suction, while reducing substantially the energy consumption. Additionally, thanks to the BERS, the electronic control system of the motorized cylinders, it is possible to recover the energy generated by the braking motor that would be otherwise lost, wasted as heat. Thanks to the special steaming box and to the finely adjustable steam suction, the decatizer WOOL BASIC provides a moderate and effective action on a wide range of finishing fields, on worsted and woollen fabrics : from the wool to the silk finishing , from cotton to man-made fibres finishing , particularly in blends with natural fibres. When used as preparation to the KD , enhances the characteristics of each type of fibre preparing the same optimally for the treatment in the KD, thus avoiding sagging. When used as finish decatizing restores softness and gives a bulkier handle to the treated fabrics removing the excess lustre created on the KD. Traditional, with a special fabric invitation and opening scray, for woven fabrics. 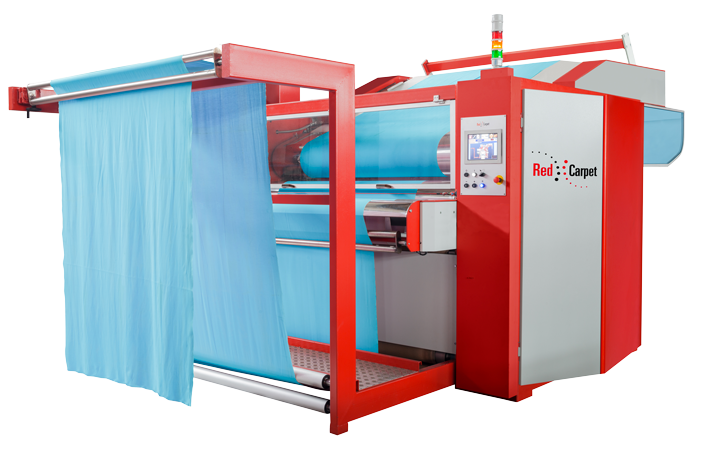 Innovative, with feeding from the top, loading cells, fabric invitation and opening scray, for knitted fabrics. Particular attention was paid to the positioning of the selvedges opening device, to ensure that, once extended, they have no way to roll up again. “Tailored to the customer” solutions are available, according to the degree of automation desired, for both knitted and woven fabrics. The exit has been designed with a conveyor belt which transports the fabric without tensions , thus making the decatizer WOOL BASIC suitable for the treatment of any kind of fabric, woven, knitted and stretched. The BERS, which is the electronic control system of the motorized cylinders , controlled by latest inverters generation , allows to recover the energy generated by the braking motor. This energy would be otherwise wasted as heat. The electronic system of the machine controlled by PLC , allows the storage of recipes on the Multilanguage “touch screen” control panel. 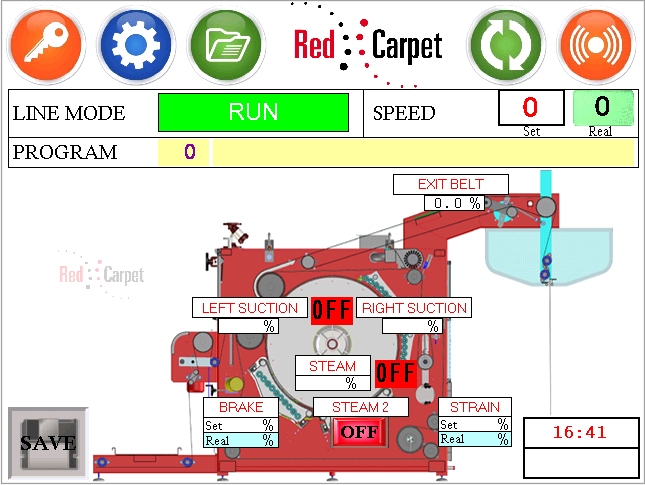 A direct line to the Red Carpet service, allows the immediate analysis of the possible problems giving indication of the actions to be taken. In case of minor anomalies the downtime is drastically reduced.